Celebrating its 20th anniversary in Palm Beach this week, the Cavallino Classic Ferrari convention has again brought dozens of Ferarri and Maserati owners, and about 400 of their cars, to The Breakers, where the main event the annual Concorso d’Eleganza judged display will take place Saturday. Registration continues at The Breakers Thursday, and the schedule includes lectures about the Italian sports cars along with related exhibits of merchandise and services. Events benefit the Children’s Wish Foundation, the Boys and Girls Club, Best Buddies, the American Council of the Blind Scholarship Fund and the Dreyfoos School of the Arts. ■ Thursday and Friday: An 8 a.m.-4 p.m. track meet at Palm Beach International Raceway, 17041 Bee Line Highway west of Jupiter, will feature competition-class Ferraris in racing events, competing for the Florida Trophy. There also will be displays of Ferrari memorabilia and accessories. Tickets are $30 for spectators. ■ Friday: A private “Showboats Yacht Hop” will take place at the Rybovich Marina in West Palm Beach. 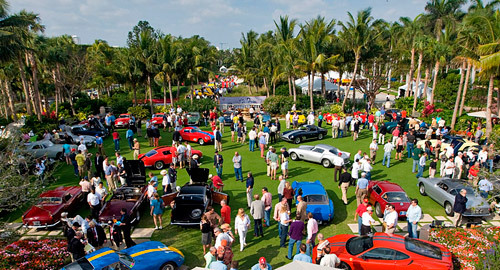 ■ Saturday: Open to the public from 9 a.m. to 3:30 p.m., the Concorso d’Eleganza on the lawn at The Breakers will feature pristine Ferrari automobiles of all models and years, with class awards and major cups presented, along with The Cavallino Cup for “Best in Show.” Tickets are $50, available at the gate. ■ Sunday: A private Classics Sports Sunday at The Mar-a-Lago Club will include pre-war and post-war to 1975 classic sports cars on display with a charity brunch and awards presentation in the club’s ballroom. Tickets are $250, available in advance through Friday in The Breakers’ Gold Ballroom.